OFF: This is the default. ScriptFTP will show the command calls, command messages and any errors encountered during the script run. 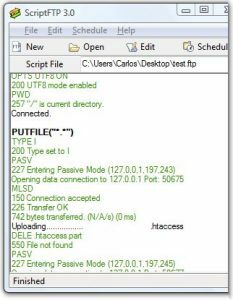 ON: ScriptFTP will also show the dialog with the FTP server, DNS resolving issues and connection loss messages. Under certain circumstances it may also show internal messages. Debug information about the status of ScriptFTP or the command currently executed. Disabling the verbose mode with VERBOSE(OFF) sets the output mode back to normal disabling the silent mode if enabled.